Well, another “big week” is off with a bang! 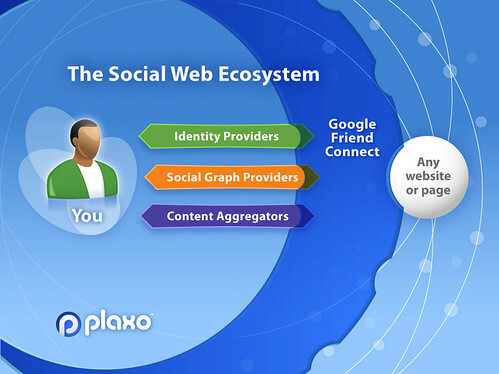 Google has just announced its Friend Connect project along with Plaxo [reminder/disclaimer: I head up marketing there], who is announcing they’re becoming a “social graph provider” in support of the initiative. John McCrea, vice president of marketing at Plaxo, said that Google’s Friend Connect is “flipping the model,” from walled gardens to a more open Social Web. “Instead of widgetizing apps and bolting them on to some corporation’s proprietary social graph, why not widgetize the social graph and socially-enable any website or web page? That’s a big, bold vision that Plaxo is 100% aligned with. As to Facebook and MySpace, it is certainly great to read the rhetoric they are now putting forth. The meme of data portability, open Social Web, and Bill of Rights for Users of the Social Web has certainly caught on! At the same time, Web businesses have begun to create standards for social site interactions on the Web — OpenId, OpenAuth, OpenSocial — that has further enabled users to move easily, and socially, from one Web site to another. Such changes seem likely to alter the nature of the big social sites, people in the industry said, as the social aspects they are known for become accessible across the Web. So, as the sun rises on Silicon Valley, I think it is the dawn of a new era. Very exciting. For a more detailed explanation, I refer you to my post on the Plaxo blog. Hey, Chris. Maybe the graphic doesn’t do it the justice you’d like, but I have to day that I’m a big fan of Friend Connect. It’s a brilliant play and completely aligned with the vision of opening up the Social Web.